I know nothing about horses. From the moment my daughter would head straight towards the ‘Horse’ section at the book store, I knew we were in trouble. We’ve tried out a few (ok, almost all) of the horseback riding facilities around Upcountry Maui, but once we found Clearview, we stopped looking. It recently came under new management, and we couldn’t be happier. Formerly known as Clearview Riding Academy, the facility is now being managed by Rachelle MacKenzie’s True North Equestrian Services. Rachelle offers horseback riding lessons, schooling and training programs, at the facility towards the top of Omaopio Road in Kula. 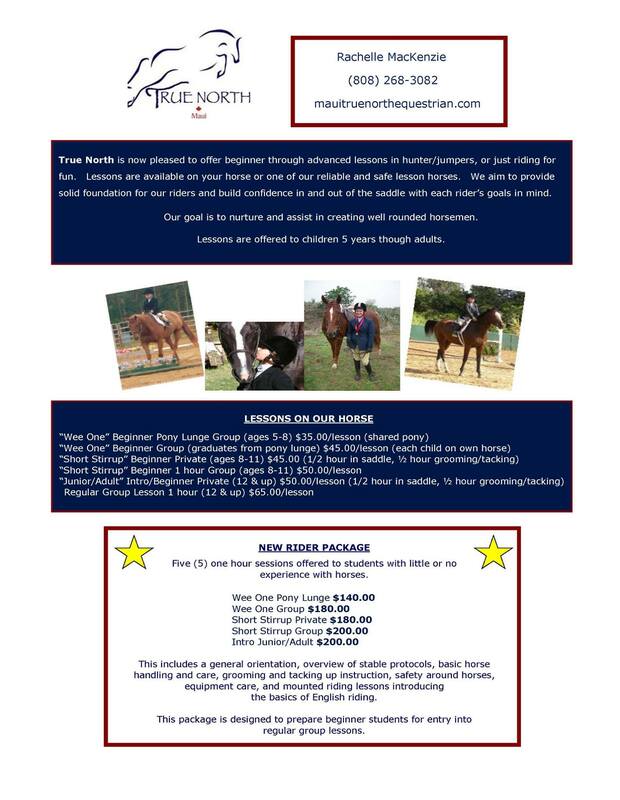 Instruction is available for ages 5 to adult – beginning rider though advanced hunter/jumper, or riding just for fun. Every rider receives an individualized program to help them meet their goals. 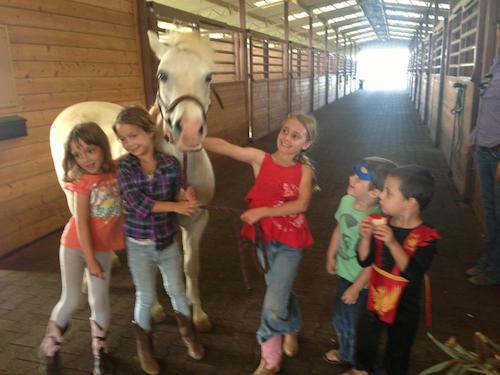 Lessons are available on your horse or one of their safe and reliable lesson horses (including Demi, the adorable Welsh Pony!) . Rachelle is acceting new clients and/or horses of all ages and abilities for instruction, training and schooling/riding. Details: Summer Horse Camp aims to teach children about the wonderful world of horses and English (hunter/jumper) riding and equitation. Through horse-related games and activities, campers learn about the care of horses, their characteristics, both on the ground and while in the saddle, in a fun-filled environment. Designed for all level riders. Rachelle grew up in Canada riding and showing in the hunter/jumper and equitation rings. She competed extensively throughout Canada and on the east coast US as a junior rider. Rachelle has been training and coaching children, juniors, and adult amateurs in Canada, the Pacific Northwest, California and now Maui since 1996. Her students and horses have qualified for and won many big events, finals and year ends including Royal Winter Fair, PCHA Championships, and Hunter and Medal Finals. Rachelle has competed successfully in all hunter and jumper divisions, through Grand Prix in both Canada and the U.S.
Rachelle’s program of classical training methods and sound horsemanship has produced winning horse/rider combinations from local shows to the AA circuit, from the short stirrup ring to Medal Finals. She has found, started and brought along countless young horses and introduced new horse/rider combination into successful partnerships and show careers.